For the opening soirée of the first Salon du Chocolat in Zurich, renowned chocolatiers and pastry chefs applied their skills to fabric in a new twist on haute couture, writes Meritxell Mir. With a jaw-dropping fashion show, they proved on Thursday evening that chocolate is not just to be savoured, it is also to be flaunted. 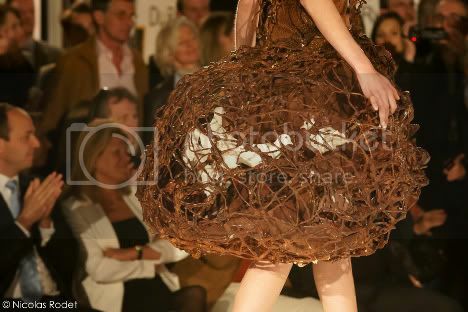 French chocolatier Jean-Claude Jeanson and designer Stéphane Martello, alias Mister Crochet, spent 120 hours creating the most spectacular choco-dress to appear on the Zurich catwalk. As is typical of his style, Martello sought inspiration in nature to create a flamboyant bird’s nest gown from 200 metres of wire covered with tissue. A sort of magician’s hat writ large, the roomy nest concealed three live white pigeons. As if this weren’t enough to dazzle the fashion aficionados in attendance, Jeanson topped off the creation with the sweetest of floral ornamentations. Leaves, daisies and roses crafted from chocolate conferred on the dress a romantic touch and sense of lightness that belied the fact the model was wearing a seven-kilogram outfit. The flowers, though still fragile, were made more resistant by mixing the chocolate with glucose, Jeanson tells The Local. While the fashion show had an operatic theme, most creators allowed themselves some creative licence. Geneva-based chocolatier Philippe Pascoët worked together with Swiss designer Elisa Sue to create a Baroque style gown. The pair attached a dark chocolate bustier, decorated with a big white chocolate heart, to a long golden train that “symbolised the foil paper that wraps the bars,” Pascoët tells The Local. But how could the models even move without breaking their chocolate shells? Jeanson says the trick is the glucose. “[When warm], the mix becomes malleable, but once it’s dry, it becomes quite rigid,” Pascoët adds. “I just want to provoke the urge in people to come and savour the marshmallows and the chocolate directly from the model,” he says. The dozen dresses will be on show at the fair until it closes its doors on Sunday evening. Anyone with a sweet tooth probably had a hard time resisting Bel’s temptation, even though the Salon is full of other opportunities to sample the classics from Villars, Ladërach or Cailler, as well as new additions and trends from the world of the chocolate. At the fair, chocolatiers are set to present uncommon blends that merge chocolate with saffron, coriander or thyme as they try to upstage innovators like Boissier. Not yet present in Switzerland, the Paris-based confectioner offers visitors a chance to try its unique choco-petals. Flavoured with lavender, violet, jasmine, rose and verbena, these colourful little chocolates leave your mouth feeling fresh as a daisy. Equally astounding is the collection from Belgian Just Chocolate, which offers a variety of pure cocoa pieces with a hint of flavours like mushroom, olive or tobacco. Tasting them, it does indeed seem these ingredients are contained within, although the manufacturer tells The Local that this is in fact just a tasty illusion. This unorthodox chocolate maker recommends sampling its delights with coffee, wine or the finest Belgian beer. Although new to the Swiss audience, the cocoa-enriched fashion show has been travelling the world for years as part of the Salon du Chocolat, the world’s largest event dedicated to chocolate. First opening its doors in Paris in 1995, it has since brought chocolate joy to cities such as Moscow, Tokyo, New York, Shanghai, Madrid and Cairo. In many ways it seems odd that it took so long for the show to make it to Switzerland, a country that holds the world record for chocolate consumption with an annual average of 12.4 kilograms per person. “We thought of coming to Geneva ten years ago, but we only managed to get 20 exhibitors,” explains Adeline Vancauwelaert, international director of the fair. “Back then the economic situation was probably OK, but now the competition is getting harder,” she says. With so many new countries becoming major chocolate consumers, especially in Asia, the major manufacturers and smaller artisans have to get ready for rising demand, she says. There are 60 participants in Zurich, a number still far from the 560 that Paris gets every year on average. “It’s a small number, but when we launched in other cities, we usually had between 40 and 80, so we’re right in the middle,” says Vancauwelaert. Over the weekend, the first Salon du Chocolat in Switzerland will bring an educational approach to the business of chocolate with conferences, demos with pastry chefs, and plenty of tasting opportunities. And there’s a bonus for the kids: at Chocoland, they will learn what’s behind their favourite treats as they get to make their own chocolate bars.